October has become Ontario’s annual month to celebrate cask-conditioned ale. A term for unfiltered, unpasteurized, naturally carbonated beer that undergoes a secondary fermentation in the cask (container). Once tapped, cask-ale - also referred to as “real ale”, has only a few days to be consumed at its peak; we call these days 'Cask Days'. 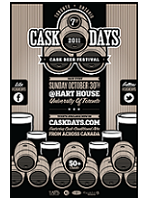 We are excited to invite you to the 7th year of our Cask-Conditioned Craft Beer Festival - ‘Cask Days’ in Toronto, Ontario on Sunday, October 30th, 2011. Cask Days was established in 2005 at barVolo and for the first time, will take on a new event space in the heart of downtown’s University of Toronto campus: Hart House Quadrangle .This year’s festival is planning to feature cask-conditioned ales from over 50 microbreweries across the country, being the first festival of its kind in Canada. Don't forget to check out some of the other events we are hosting prior to Cask Days this year. Hope to see everyone soon! Cheers!